ZESI provided utility design for this project. This project involved the design of an 8-inch sanitary sewer along Hooper Road From approximatly 1,400 feet south of Spectrum Boulevard to approximatly 500 feet north of Spectrum Boulevard and a 24-inch sanitary sewer along Spectrum Boulevard from Hooper Road to Kirby Drive. Zarinkelk Engineering Services prepared the plans, specifications and cost estimates for the manhole rehabilitation project for the Golden Acres Subdivision. The Golden Acres Subdivision is locate west of the Sam Houston Tollway between Old Vista Road on the south and Pine Avenue on the north. The project included 50 manholes scattered throughout the subdivision and improvements included SpectraShield liners, cone, frame and cover replacement and frame and cover adjustments. ZESI supervised the construction of a new ammonium sulfate chemical storage and feed building and associated chemical feed equipment and controls. The project also included the installation of chemical feed piping, new ammonia injection lines from new Ammonia building to surface, and groundwater lines. ZESI prepared the plans, specifications and cost estimates for the design of a sanitary sewer relief line to replace Lift Station 16A. Demolition of the lift station was also part of the project. As sub consultant ZESI provided a storm water pollution prevention plan and traffic control plans. The estimated construction cost is $3 million. ZESI provided GIS services for this project. The project included production of presentation and report quality GIS figures to accompany the Demi John Wastewater Feasibility report. The figures illustrated water quality data testing results completed by the Brazoria County Environmental Health Department, OSSF TCEQ guidelines, TCEQ registered OSSF systems within the community, proposed gravity sewer systems, proposed air vacuum systems and proposed phase implementation plans. The Edgebrook Reconstruction Project involved reconstruction of 1.5 miles of a fourlane boulevard roadway section. Utility adjustments included replacement of 8-inch and 10-inch gravity sanitary sewers, a 12-inch water main, and a 24-inch force main. The project included a categorical exclusions report, an impact study, a hydrology study, and Phase I and Phase II environmental site assessments. ZESI assisted LAN with evaluation and rehabilitation design options for the W. Fondren area in the Southwest Service Area. The evaluation included consolidation and elimination of the lift stations and possible replacement with gravity sewers. The recommendations included rehabilitation, upsizing, and deepening of lift stations to receive the gravity flow. The assignments included site visits, preparation of exhibits, construction drawings, specifications and cost estimates. ZESI prepared project drawings, specifications and cost estimates for the Round 2 TDRA project to reduce infiltration and inflow (I/I) in the sanitary sewer system. This project is funded by the Hurricane Ike Recovery Program. The work included rehabilitation of sanitary sewer lines including upsizing pipe 6 inches and smaller by pipe bursting and in some locations point repair and cured-in-place lining. Manhole rehabilitation included manhole rings and seals for manholes located in the flood plain to prevent I/I. 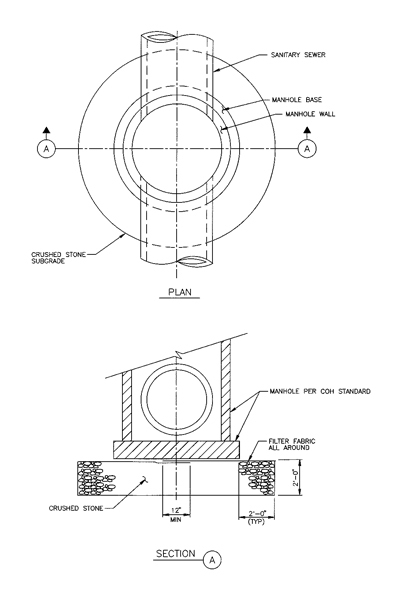 For manholes located in the flood plain, air relief valves were proposed. Rehabilitation will be completed for a total of approximately 89 manholes, 170 service connections, and 28,615 LF of pipe ranging in size from 4 to 24 inches. ZESI provided support and professional engineering services associated with the quality control review of all design work products and construction package deliverables. ZESI provided professional engineering services associated with the quality control review of all design work products and construction package deliverables, associated with the repair of 22 City of Galveston and west end (Pirates Beach and White Sands) lift station sites. Included in the quality review was hydrualic calculations, pump selection, cross-discipline review of civil, mechanical, electrical structural and instrumentation and controls, cost estimates and specifications. ZESI provided sub consultant design support for the analysis of the West District and Upper Brays wastewater collection systems. Tasks included the evaluation SCADA data from the City of Houston, analysis of rainfall events corresponded to high wet well levels for the sanitary lift stations, research and gathering of information for the project lift stations and wastewater treatment plants, and assistance with the development of the project report.